Supporting your business to innovate and grow with free advice, access to specialist university expertise and grants. Innovation Bridge is partly financed by £1.948 million from the European Regional Development Fund (ERDF). businesses based in Norfolk, Suffolk, Cambridgeshire and Peterborough, Rutland, South Kesteven, South Holland, Uttlesford District, North Hertfordshire and the South East Midlands: Bedfordshire, Luton, Milton Keynes, Aylesbury Vale, Northamptonshire and Cherwell District. Stephen Catchpole, Chief Executive of SEMLEP, said: “We are delighted to be supporting the exceptional work of the Innovation Bridge project, which is giving local businesses the opportunity to kick-start their growth. 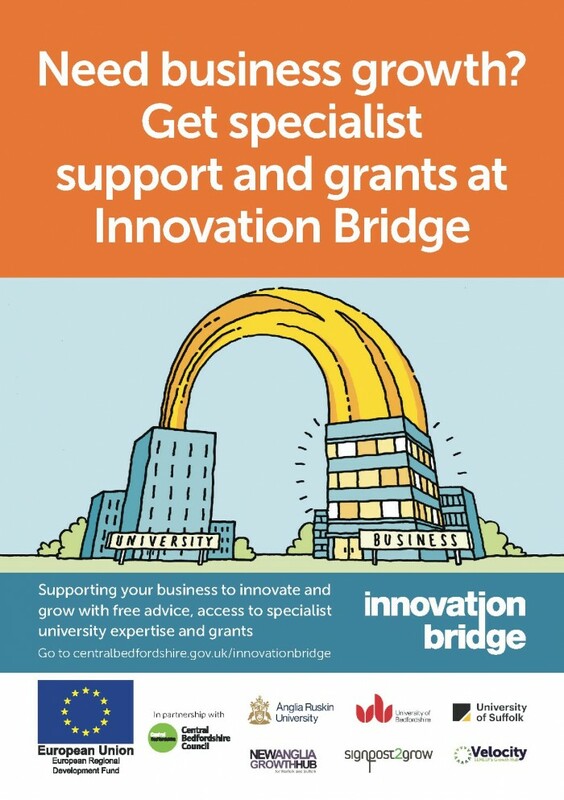 To find out if your business is eligible contact the Innovation Bridge team on 0300 300 8582 or visit the website.